The ability to set your own custom character limit. Plus the ability to add almost unlimited characters on the fly. The ability to email in new entries by replying to your daily reminder or by emailing today@280daily.com or yesterday@280daily.com. If you have links enabled on your account, just replace your subject line with the link you’d like to include. You can also attach a JPG or PNG photo to your entry. 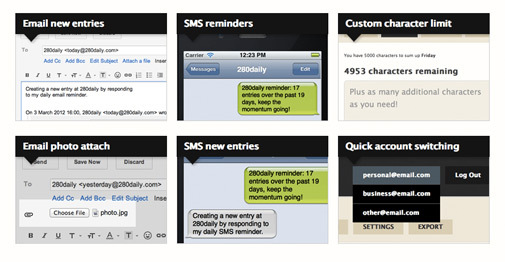 Users in the US, UK and Canada can also send it entries through SMS and also receive SMS reminders daily, every other day or weekly. Some users have separate logins for different areas of life (e.g. personal and business). You can now quickly switch accounts with just one click. When linked, PRO is activated across all accounts. PRO user book purchases are automatically discounted 10%. New PRO only features will be released over the coming months and years. Find out more about upgrading to PRO! Along with PRO, we’ve also rolled out improvements in photo support and new entry selection for all users.